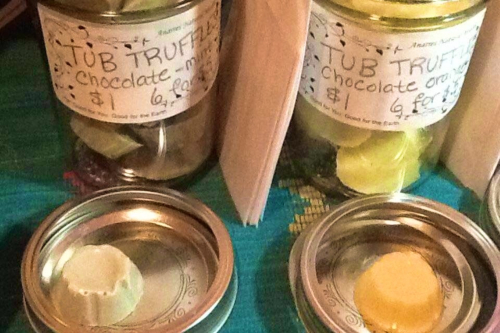 Tub Truffles: Various Cocoa Concoctions! Handmade moisturizing, fizzing bath bliss with pure unrefined cocoa butter. Just pop one in the bath with you and enjoy! Delight in these little bath bombs for fragrant and moisturizing bathtub fun. Ingredients: natural soda sodium bicarbonate USP#1, citric acid, *corn starch Zea mays, **cocoa butterTheobroma cacao, essential oils and optional clay or *seaweed. Directions: Drop one on yourself in a warm bath and enjoy moisturizing fizzing goodness. Proudly packaged in 100% vegetable cellulose clear compost-able bags or repurposed plastic. or a dozen in a re-purposed egg carton. Please specify the variety you want in the comments with your order. If you don't specify, we will choose from our stock.